The ICYLANDS project, at the University of Washington, is aimed at quantifying the coupling of the carbon and water cycles and the interacting physical, chemical, and biological (PCB) processes that control carbon exchange between cold, dry terrestrial ecosystems and the atmosphere. The 2006 season is the second year of UNAVCO involvement in this project. 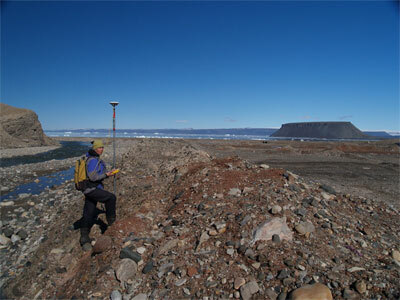 During the 2005 Thule campaign, numerous mapping surveys were completed and a set of GPS monuments were installed in soils at four study sites to measure downslope soil motion, or solifluction. In July 2006, the monuments were re-occupied to obtain solifluction velocity vectors. 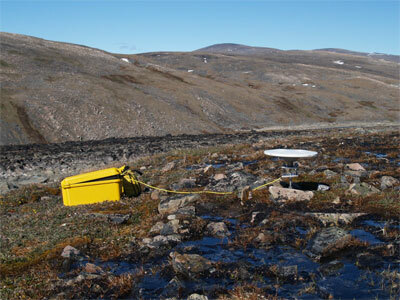 These measurements represent the first GPS-based study of soil evolution in the High Arctic, and centimeter-level displacements of several diverse soil features were demonstrated. In addition, six new monuments were installed in areas of particular interest based on the velocity results obtained. Further mapping operations were also completed, yielding a comprehensive survey of six study areas. Figure 1 - Occupation of GPS monument on a solifluction lobe. Figure 2 - Surveying a transect across the South River study area.